Click here to find a radiator cooling fan for your vehicle. Modern engine designs, and higher under-hood temperatures are placing increasingly heavy loads on engine cooling systems, and the radiator cooling fans are the only things that stand between effective engine temperature management, and engine failure caused by overheating. What Is The Function Of A Radiator Cooling Fan? Radiator cooling fans are used to increase the airflow through a radiator core in order to allow the engine coolant passing through the radiator to shed its heat. This is most important when the car is at a stop or traveling at very low speeds, as in this case little to no air would otherwise flow through the car’s front grille and through the radiator. Electrically operated radiator cooling fans are attached directly to a DC motor, which is in its turn, attached to a fame that attaches either to the radiator itself, or to the bodywork via two or more brackets, straps, or rubber mountings. In many cases, the radiator fan motor is activated when a bi-metal switch (aka radiator fan switch) that is in direct contact with the circulating engine coolant closes, which happens when the coolant reaches a predefined temperature. This closes a circuit, which feeds power to the fan motor via a dedicated relay. In some designs however, the radiator fan switch contains two switches that close at different temperatures; if the low temperature switch closes, current to the fan motor is limited with resistors, causing the fan motor to rotate at a low speed. When the high temperature switch closes, full battery current is fed to the fan motor, causing it to rotate at its maximum design speed, thus maximizing the airflow through the radiator. If the coolant temperature is below a minimum threshold, no current is fed to the fan motor, and the fan does not rotate. In other designs, the fan motor is controlled by the ECU (Engine Control Unit) directly via input data obtained from one or more engine coolant temperature sensors located on the engine. These designs allow for precise control of the fan speed, or for the operation of two radiator-cooling fans that can be controlled independently of each other. At low road speeds, the regulation of the engine’s temperature is wholly dependent on the operation of the radiator-cooling fan motor. Thus, if the fan motor (or fan motors in some cases) fails to operate for any reason, the engine coolant cannot shed its heat efficiently because there is an insufficient airflow through the radiator core, and serious, if not always-fatal engine overheating is the inevitable result. Although damaged or defective fan motors can influence both the speed and duty cycles of radiator fans, it is more common for wiring and or sensor issues to influence the speed of radiator fan motors. If the fan motor runs continuously for any reason, some engines may not reach their optimum operating temperature, which plays a critically important role in many engine and fuel management functions. In these cases, fuel consumption can increase measurably, engine power can decrease, and misfires may develop as the result of fouled spark plugs. Worn or damaged bearings or bushings in fan motors can cause excessive free play, which can cause severe mechanical noises, or even damage radiator cores when fan blades come into contact with the soft radiator core. Replacing radiator fans is usually a simple, straightforward procedure that should be well within the capabilities of even novice DIY mechanics. Note that you would typically require a mechanic’s socket set, a variety of flat and Phillips screwdrivers, and perhaps a set of small wrenches with open and box ends. Note that in most cases, replacement fan motors come with the frame that attaches to the vehicle, or the radiator, which simplifies the replacement procedure considerably. Step 1 – Make sure the engine is cold to prevent burns and scalds before performing any work. Step 2 – Study the layout of the radiator hoses, and locate all attachment points. Note that in some cases, the top radiator hose may prevent removal of the fan frame, but do not detach the hose from the radiator unless it is necessary, so as not to lose any engine coolant. Step 3 – Locate and disconnect all relevant electrical connectors, remove all retaining screws/bolts/clips using your assortment of screwdrivers and sockets, and place then aside. Remove the entire fan assembly from the vehicle, and place it aside, but out of the way. Step 4 – Fit the replacement fan assembly, but take great care not to damage to radiator core during this step. Insert all retaining screws/bolts/clips, and make sure everything is tightened properly. Reconnect all electrical connectors. Step 5 – If any radiator hoses were removed, make sure all detached joints are tight during reassembly to prevent coolant leaks. Step 6 – Start the engine, and allow it to idle while observing the temperature gauge. The fan should kick in at around the midpoint on the scale – if the fan does not kick in at this point, recheck all electrical connections. Step 7 – If the fans do kick in at the correct time, verify that the engine temperature does not increase beyond the “NORMAL” mark on the heat gauge. If any radiator hoses were detached, allow the engine to cool down for at least 8 hours, and adjust the coolant level if necessary. Dorman radiator cooling fans are designed to be direct fit replacement for all OEM applications, which means that all Dorman fans meet and often exceed OEM specifications and standards in terms of reliability, durability, and efficiency to prevent engine over heating issues. Moreover, all Dorman fan motors are extensively tested before packaging, meaning that the fan you purchase will work right, straight out of the box. We have had great luck with Dorman radiator fans over the years, and expect that you will be happy should you choose to install one. Click here to find a Dorman radiator cooling fan for your vehicle. All Spectra radiator fan assemblies come with all required hardware to ensure a proper, direct fit replacement for OEM equipment. In addition, all Spectra fan assemblies are constructed with high quality materials, and all fans are extensively tested before packaging and shipment. Spectra makes great radiators, so it comes as no surprise that their other cooling components, such as radiator fans, are also top notch. We have used Spectra for some time now, and have always been satisfied when we have gone this route. 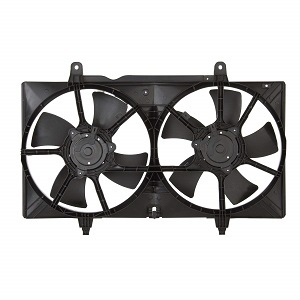 Click here to find a Spectra radiator cooling fan for your vehicle.